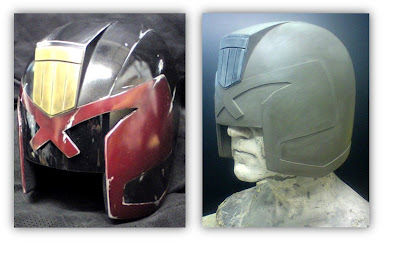 MarketSaw - 3D Movies, Gaming and Technology: New Images Of Judge DREDD's Helmet!! New Images Of Judge DREDD's Helmet!! Super cool shot of Judge Dredd's helmet from the upcoming Karl Urban comic book adaptation DREDD. These shots (via Bleeding Cool) are from the sculpting artist Edmund Woodward who is working on the production. The link above has a few more mockup shots as well. You can check out all of our DREDD coverage right here, including the first shot of Urban as Judge Dredd. More when I get it!